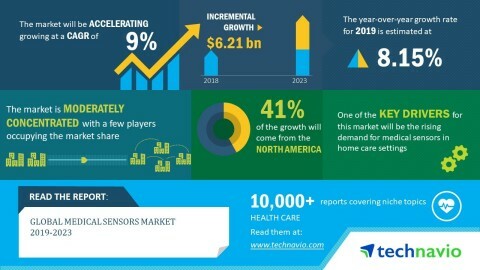 LONDON--(BUSINESS WIRE)--Technavio has announced the release of their research report on the global medical sensors market for the forecast period 2019-2023. This global medical sensors market analysis report segments the market by end-user (hospitals, clinics, and home care settings) and geography (Asia, Europe, North America, and ROW). “North America will be the largest contributor to the global medical sensors market. The presence of many medical sensor vendors in the US will drive the growth of the market in the region. In terms of growth rate, the Asian region will witness the fastest growth during the forecast period. The increasing prevalence of chronic disorders and the increased focus toward healthcare will increase the demand for medical sensors. Emerging economies such as Southeast Asia and India will further drive the demand for medical sensors,” says an analyst at Technavio.